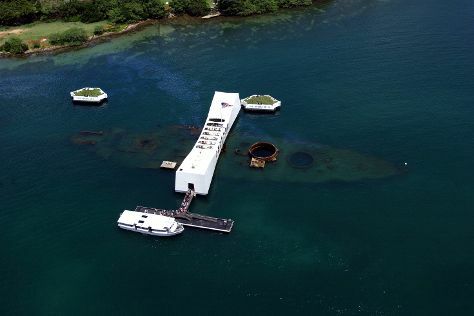 Visit USS Arizona Memorial and Iolani Palace for their historical value. Get a sense of the local culture at Battleship Missouri Memorial and Makapuu Lighthouse Trail. Get out of town with these interesting Honolulu side-trips: Kailua Beach Park (in Kailua), Haleiwa (Waimea Bay & Sunset Beach Park) and Swim with Dolphins (in Waianae). There's much more to do: look for all kinds of wild species at Hanauma Bay Nature Preserve, examine the collection at USS Bowfin Submarine Museum & Park, tour the pleasant surroundings at Waikiki Beach, and explore the gorgeous colors at Pele's Chair. To find maps, more things to do, where to stay, and tourist information, go to the Honolulu trip planner . Tulsa to Honolulu is an approximately 12.5-hour flight. You can also do a combination of car and flight; or do a combination of bus and flight. Traveling from Tulsa to Honolulu, you'll gain 4 hours due to the time zone difference. In February, Honolulu is much warmer than Tulsa - with highs of 81°F and lows of 69°F. Wrap up your sightseeing on the 20th (Wed) to allow time to travel back home.